Say hello to my favourite Mango Colada smoothie bowl this season! and best part is it keeps you full for hours. Its almost like a sorbet or a vegan ice-cream! Ultra creamy, naturally sweet, mangoe-y, healthy and so delicious!! Oh and did I mention that its Vegan and Gluten free too? Mango season has just kicked off and I have already shared recipe of Mango chilli lemonade, Mango salad with mango-mint dressing, Spicy potato tacos with mango salsa and Mango shrikhand. Needless to say that I am obsessed with Mangoes! Not only are mangoes lip smackingly delicious, they are packed with tons of vitamins and minerals. Consuming seasonal mangoes prevents heart disease, lowers cholesterol, improves digestion and regulates blood pressure. For this smoothie, I blended frozen banana and mango with coconut milk. For acidity, I added lemon juice to cut through all the natural sweetness and added a bit of mint for the freshness. Frozen fruits make the creamiest of smoothies and of all the smoothies I have shared before, this is one of the creamiest and delicious smoothie ever. I topped the smoothie bowl with super foods like chia seeds, pumpkin seeds, shredded coconut and pomegranate for further nutrition. You can add different nuts like walnut, pecan, almonds and other super-foods like flax seeds, hemp seeds too. Add frozen banana, mangoes, coconut milk, lemon juice and mint in a high-speed blender. Mix untill creamy and smooth. Add more coconut milk or water if you find it thicker. 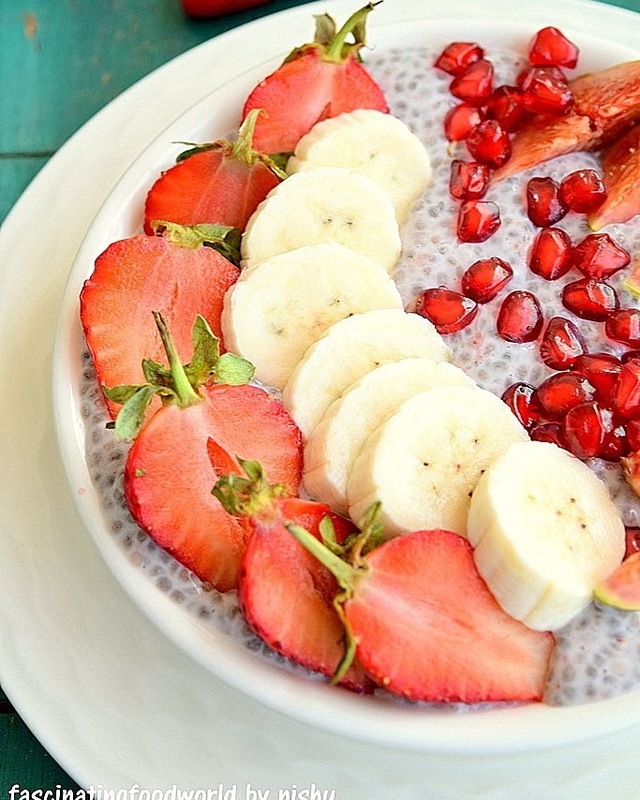 Empty in a bowl and top with shredded coconut, chia seeds, pumpkin seeds and pomegranate. Banana or any fruit can be frozen by chopping them into cubes and packing in an air-tight container or zip lock bags and placing in freezer. Smoothie bowl is eaten with a spoon as it has thicker consistency than a smoothie.